Earlier this week, students sat the first paper of the new GCSEs. We thought the OCR B paper was fair. A few interesting variations from the usual structure of the paper, and less emphasis on some aspects of the specification than we might have expected. Worth reading a couple of articles by teachers on the new GCSEs to get some other perspectives. There is a TES piece here by Mark Enser. There is a temptation to see the specification as a long checklist and to base the curriculum on simply working our way through it and making sure we get to the end in time for the exam. 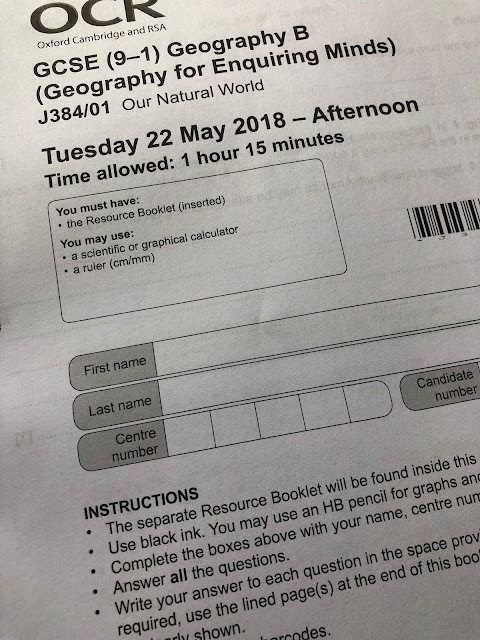 The issue with this approach is that it ignores the links between topics that you see when you look back at the exam paperSecond is a piece by Jennifer Monk on her blog. Read that here. Some interesting comments in both. If you feel disheartened at reading recent offerings about the new exams, remember context is everything. No two situations are alike. Culture, prior knowledge, ability, circumstance, are only part of what you contend with. You work to the best of your ability; but you’re human. Geography was also the subject of several articles this week: in the Times there was a story of how middle class students are apparently drawn to the subject, and the Telegraph did a fairly lazy piece on the subject too - why does every mention of Geography resort to mentions of 'colouring in' still?